A few weeks ago an email appeared in my inbox from the lovely people at Jumeau, with the offer of two bags of my choice for a review. After looking through the lookbook, I just had to say yes. 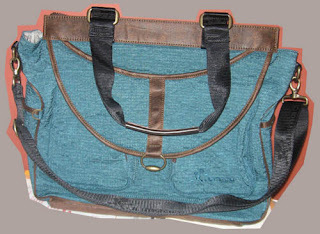 I decided on the Lucienne, which is the super rad briefcase-y blue bag with brown trim and the Feather, the corduroy hobo with space for everything. I received the package at my work a few days later and my coworkers were all swooning over the bags! Like I mentioned earlier, the Lucienne is a quasi-briefcase bag with tons of pockets, including a padded one for a laptop. 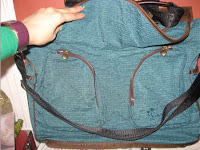 The bag is perfect for a total packrat like me it has side pockets, a zipper in the back and another two zippered compartments in the front. Inside, apart from the laptop compartment, are slots for credit cards and your choice writing tool. It's really perfect for a commuter student always on the go or someone with a lot of frequent flyer miles under their belt. Everything is accessible and the shoulder strap is sturdy and won't dig into your shoulders and leave you in pain. A version made with organic cotton and bamboo is also available as part of their Green collection. 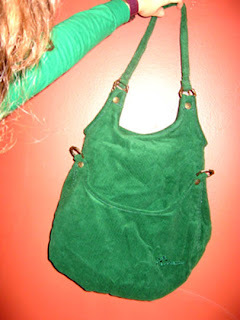 The Feather is my favorite bag and it will probably be my official grab-n-go bag for Spring. The most important feature are the long straps, which means I can just grab the bag and sling it over my shoulder without too much trouble and I won't have to worry about it slipping off my arm the entire day (don't you just hate when that happens?). It features a zip closure as well as an inside pocket with a zipper and it's incredibly roomy. Like I said before, I'm a total packrat and my bags often weigh 1000 lbs because of all the stuff I carry, which makes the two, yes TWO, outside pockets a winning detail in my eyes. This bag will fit my books and my tiny sketchbooks and my takeout food and even my cardigans when it gets to those days were its chilly in the morning and warm in the afternoon. The dark hunter green corduroy will stand out against pretty much everything I wear, and will bring a relaxed, casual vibe to everything I wear, which is the whole point of spring/summer dressing anyways, right? For more information check out Jumeau online.